It’s well documented on here that I loathe sleeping in the loft room. I so long to swap rooms with the boys and move back into the master bedroom. All in good time, hopefully we shall be switching this weekend, I’m not holding my breath! 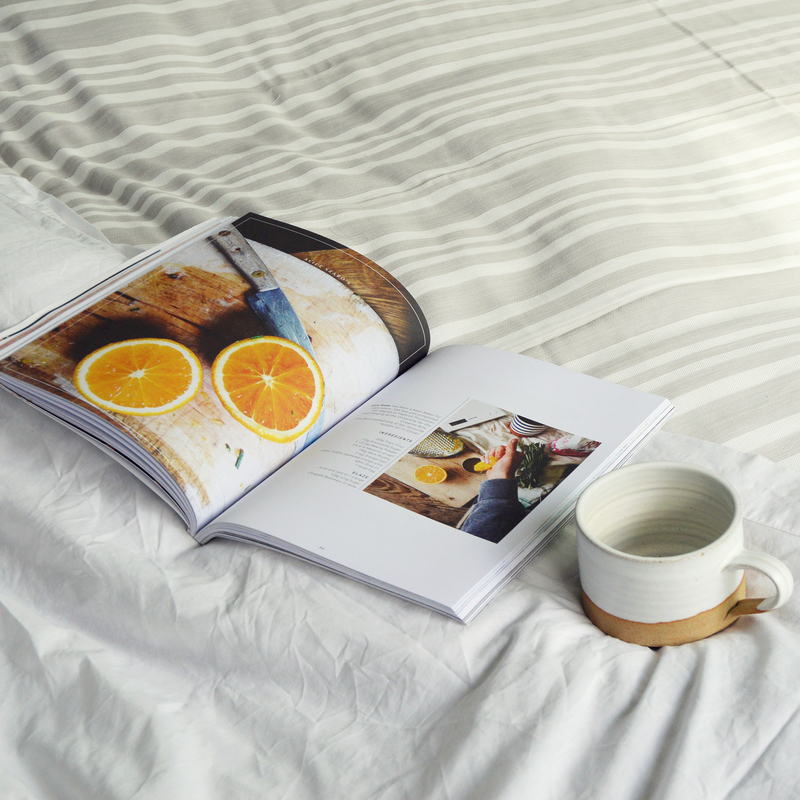 In order to love going to bed, in my mind, the key is having really beautiful bed linen. Soft, clean, light and fluffy as a cloud, making the time in bed as pleasurable an experience as possible. In recent months I have become a bit of a sheet snob, and searching out quality vintage linens from flea markets. Which is really lovely to do, but finding such beauties is few and far between. Until I discovered the Secret Linen Store. Beautiful, 100% cotton and lovely designs too. Everything in the shop is designed by the team, so you won’t find it elsewhere on the high street. Only 100% cotton yarns, spun from a combination of Egyptian and other long staple cotton is used in each item. They also have a choice of three finishes soft, crisp, or smooth. I personally like linen to feel soft and loose, like a comfy old t-shirt. 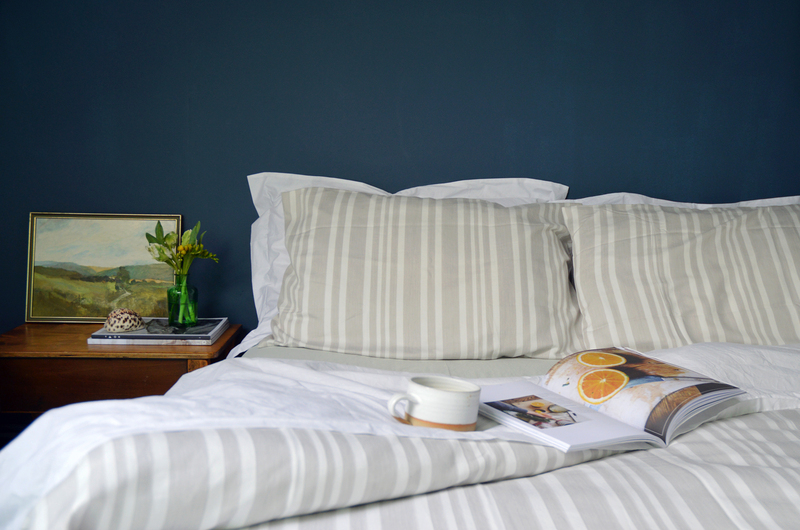 Looking through their range of duvet sets I plumped for this grey denim stripe which I think works beautifully with the navy blue wall. 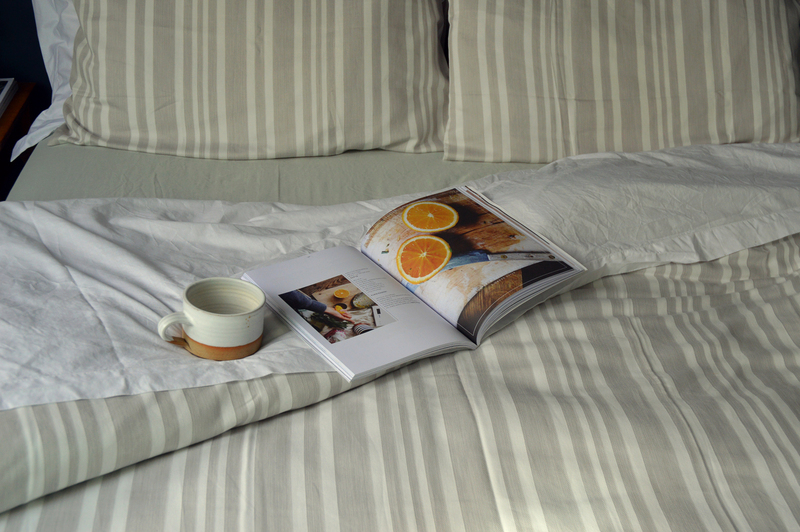 The fabric is a super soft brushed cotton, and feels wonderful to sleep in or to lounge around reading a magazine with a cup of tea. The lovely people at the Secret Linen Store are kindly offering one lucky Littlegreenshed reader a chance to win two of their Belgian linen cushion covers. All you have to do is complete the little rafflecopter widget below to enter. Winner will be announced on Friday 13th March. During the giveaway, the Secret Linen Store is offering 10% discount off everything in their store, if you use the code: WELCOMELGS10 – happy shopping! I love the Relaxed Denim, Dove Grey Cotton Bedding Set. I love the Botanic, Duck Egg Cotton Bedding Set because the gorgeous colour makes me think of spring. I like the Meadow Mink! I love the teal set! Gorgeous! Ooooh can i pick two? ;) I absolutely love the Teasels and Meadows set which would go nicely in the spare room we have. Oh I think it would have to be the Relaxed Denim Natural duvet set, just reading the word relaxed has sent me into a lovely cosy lull! Ohh – so gorgeous! I just bought new sheets from John Lewis and love them – but these look so luxurious! The Artichokes Purple Duvet Cover. So gorgeous. Dotty, Coffee Cream Duvet Cover Love this!! Love he botanic duck egg set. Olives yellow cotton bedding set. I like the Relaxed Denim Graphite Grey Cotton Bedding Set. Oh Dear….serious linen envy! !……………Teasels Gray……Teasels Navy….well just Teasels really…tho would’nt say to any of these lovelies!! That looks super lovely and soft, I always worried that linen might be a bit rough on the skin to sleep in but this looks very cosy! I like the botanic duck egg set! I love the navy artichokes duvet set, it is perfect! Lovely linen especially the duck egg blue for my daughters room.